The people who made Portal 2 want to make it easier for you to make more Portal 2, according to a new report about the making of the game's Peer Review expansion written by GTTV host Geoff Keighley. In a free expansion to his PC, Mac and iOS behind-the-scenes article/app The Final Hours of Portal 2 that will be available today, Keighley explains that Valve people are working on "a Photoshop for test chambers," a user-friendly editing tool that would allow amateurs to easily craft new Portal 2 levels. 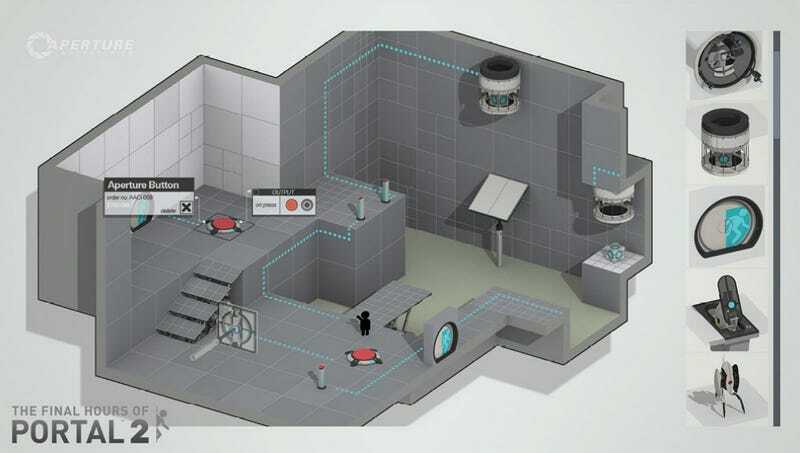 These folks are also developing a system that would allow Portal 2 players to access the new levels from within the game, without having to go outside the game to access them. "Now maps will appear on an easy to use menu, dramatically expanding the potential audience for fan-created content—and hopefully making it available on the consoles as well." Exciting as this might be for Portal 2 fans, the cleverest idea is that, as Keighley writes, "the writers are even discussing the idea of adding a personality to the editor... [I]magine what it would be like to have GLaDOS berate you every time you spell something incorrectly in Microsoft Word and you'll have a sense of where this can go." Valve may have worked with Keighley on this app and given him access for this info, but they don't confirm if all this is definitely going to be released—or just is in the experimental stages. Keighley's update shares many more details about the making of this month's Peer Review DLC and some tantalizing details about ideas considered but scuttled for the expansion. Let's just say, we could have had DLC in outerspace, if only Valve had more time and resources. Bummer! Check out the app for more details. If you have it, look for all this and more in a bonus chapter that should be available any minute now.